World attention will be on Sri Lanka again on Thursday November 1. The United Nations Human Rights Council (UNHRC) in Geneva will review the country’s record during a three and half hour session beginning 2.30 p.m.
Like for all other 193 member countries of the UN, the event is routine. Every four or five years, the human rights record of members is reviewed under the Universal Periodic Review (UPR), a mechanism which the UN believes improves the situation on the ground. However, for Sri Lanka the event is significant for many other reasons. Three months after this event, in March next year, the UNHRC is set to review matters related to the US-backed resolution on Sri Lanka. This was adopted in March this year at the 19th sessions. Issues there extended from alleged human rights violations to probing “extrajudicial killings”. How the government responded to them is due to come up for scrutiny in March next year. In the light of this, several western nations are watching the UPR sessions closely. Their interest has been heightened by what they believe are newer developments in Sri Lanka including ‘alleged state interference in the judiciary,’ ‘no forward movement’ in the government’s reconciliation efforts and media freedom issues among other matters. It comes as the cold war between the Executive and the Judiciary showed clear signs of heating up. This was after Pradeepa Gamini Suraj Kariyawasam of 170 Lake Drive, Colombo 8, was indicted before the Colombo Magistrate’s Court for causing a loss of more than Rs. 391 million to the government and for alleged corruption. The former chairman of the National Savings Bank (NSB) is the husband of Chief Justice Shirani Bandaranayake. He had earlier served as chairman of the Insurance Corporation of Sri Lanka. The UPR itself has also sent ripples in government circles. These are over questions on the possible role of India, which is heading a troika that will prepare the report of the Working Group once the discussion on Thursday is over. It may be recalled that India voted for the US-backed resolution in March this year. As revealed in the political commentary last week, relations between Colombo and New Delhi have hit a new low, largely due to that vote. The measures government leaders contemplated in the past weeks including the repeal of the 13th Amendment to the Constitution caused serious concerns in India. Under such circumstances, New Delhi’s role at UNHRC’s 22nd sessions in March next year is cause for study by the government. Though belatedly, some measures to rectify the situation have got under way as tensions continue to remain. The current sessions of the UNHRC began on October 22 and will continue till November 5. Until last Thursday, the human rights records of eight countries have been reviewed. They were the Czech Republic, Argentina, Gabon, Ghana, Ukraine, Guatemala, Benin and the Republic of Korea. Tomorrow (Monday) the case of Switzerland will come up followed by Pakistan and Zambia. Japan will follow on Wednesday. Besides Sri Lanka, the case of Peru will also be taken up on Thursday. Of significant interest during the current sessions is the fact that the largest number of speakers, 99 of them, want to address the Council on Sri Lanka’s case. As a result, each speaker has been allotted only a minute and 22 seconds. This is the lowest among the time limits allotted. In the case of Peru where 55 speakers have registered so far with the Palais des Nationes, two minutes are allowed per speaker. Among the four countries on which NGOs, including those based in Colombo, are conducting meetings in Geneva on the sidelines of the UPR process, is Sri Lanka. Others are Guatemala, Japan and Pakistan. A total of 42 UN member countries are reviewed each year during three Working Group sessions dedicated to 14 countries each. Already presented to the UNHRC is Sri Lanka’s national report which recalls the assurances given by the government during sessions in 2008, the action taken so far and the newer developments. India which heads a troika together with Spain and Benin will prepare the report of the Working Group. Before the review, they will receive the written questions and/or representations on an issue raised by UNHRC members and relay it to the Sri Lanka delegation. Their report will contain a full account of the proceedings, and will be formulated with the involvement of Sri Lanka delegation and Secretariat staff. India will introduce the report on November 5 between 3 p.m. and 4 p.m. The troika usually consists of three countries’ delegates assisting the review. They are picked by the drawing of lots from among UNHRC members and different troikas function for different countries. This was whilst Kariyawasam was serving as chairman of the National Savings Bank. He is also accused of corruption for allegedly recommending his own name and that of Shan Chandrasekeran Shanmuganathan to be appointed as members of the Board of Directors of The Finance Company. According to the plaint, the offence had allegedly been committed on April 27, 2012 or on a date close to it. The Court has directed Kariyawasam to appear before it on February 28 next year — four months away. In May, President Mahinda Rajapaksa ordered the cancellation of a stock exchange deal where the NSB had purchased 7,863,362 shares of The Finance Company. It was at a price of Rs 49.74 per share when it was claimed that the price of shares was as low as Rs 30. The NSB had paid Rs 391 million, though the transfer of the funds was reportedly halted. Compounding the situation was a full page advertisement the NSB directors inserted in the national media thereafter. In that, they declared they had decided not to pay NSB money and that the decision has been conveyed to the Treasury. Despite a public outcry then for a full-fledged investigation to expose all those involved, a probe by CID detectives came amidst growing tensions between the Executive and the Judiciary. In a front page report in the Sunday Times of September 23 the Chairman of the Commission to Investigate Bribery or Corruption, retired Supreme Court Justice Jagath Balapatabendi, declined to comment on why this particular inquiry was being fast tracked. Documents submitted by Taprobane Securities (Pvt) Ltd to the National Savings Bank (NSB) to purchase shares of The Finance Company. A letter addressed to Shan Shanmuganathan by the NSB Chairman on 21.03.2012. A proposed agreement between the NSB and The Finance Company on confidentiality of non-disclosure of information. A letter addressed to General Manager (Monitoring) of the Colombo Stock Exchange Renuka Wijewardena by a Member of the Board of Directors of Taprobane Securities (Pvt) Ltd, N.S.Niles, dated 24.07.2012. A letter from Secretary of the Board of Directors of the NSB to the Chairman of The Finance Company and Board of Directors dated 27.4.2012. A newspaper advertisement prepared by the NSB. The hand written notes of the Secretary of the Board of Directors meeting held on 26.4.2012. A Letter from Authorised officer of the Ministry for NSB Finances and Plans to the Bank of Ceylon directing to cancel a pay order of Rs. 390,360,000 to the Sampath Bank. The news of Kariyawasam’s indictment was the talking point in Hulftsdorp, the nerve centre of the country’s legal profession and the judiciary. It came in the backdrop of persistent speculation that plans were under way by the government to impeach the Chief Justice, a claim which was denied by some government ministers. However, the matter did come up for discussion when a team of ministers and legal advisors to the government met at ‘Temple Trees’ late last month to determine a course of action. This is in the aftermath of a three-page statement issued by the Judicial Service Commission (JSC). In that, the JSC, referring to their Chairman and two members (Chief Justice and two Supreme Court Judges) said they were invited for a meeting with the President. It alleged that there was “interference in the judiciary” and said there was “proof” of such instances. However, the charge was strongly refuted by the Presidential Secretariat which said the invitation was to discuss “budgetary allocations” and matters relating to “scholarships for judges”. Several leading lawyers in Hulftsdorp were speculating whether the indictment of Kariyawasam, either by design or otherwise, was intended to trigger any resignations in the higher echelons of the judiciary. However, legal sources close to the judiciary discounted such a possibility on the grounds that “those in the highest levels of the judiciary have no cause to resort to such a course of action. They will continue in office.” One highly placed source said, “Any such move would only endorse” what he called “allegations even before they are proved in a court of law.” In the light of this, even moves by some influential sections to force the resignation of the JSC Secretary Manjula Tilakaratna have not been successful. An informal plea had been made by a member of the judiciary, an official source said. External Affairs Minister G.L. Peiris, who was given a telling off last month by the President for his advice on the sharp differences between the Executive and the Judiciary, told Parliament that Tilakaratna’s appointment was “unconstitutional” but did not explain why the government had allowed him to remain in that office for more than a year. Tilakaratna was previously Assistant Secretary and later Deputy Secretary of the JSC, both for a cumulative period of three years. The Sunday Times learnt that much before Tilakaratna, who is said to be 29th on the list of succession, another candidate, the brother of a former Chief Justice who was also 29th, served as Secretary to the JSC. The bone of contention that brought tensions between the Executive and the Judiciary to the fore, it is now confirmed, is the Divineguma Bill. The Supreme Court ruled last month that “we make a determination in terms of Article 120 read with Article 123 of the Constitution that the Bill in question is in respect of matters set out in the Provincial Council List and shall not become law unless it has been referred by His Excellency the President to every Provincial Council as required by Article 154 (G) (3) of the Constitution.” The Bill was introduced in Parliament on September 18. The Sunday Times has learnt that an initiative for the Attorney General to move for a revision on that (September 18) morning, before the SC determination was read out by the Speaker, Chamal Rajapaksa, later that afternoon, did not materialise. Hence, the government heeded the SC ruling and sought the approval of all Provincial Councils for the Bill. A controversy arose over Northern Province Governor G.A. 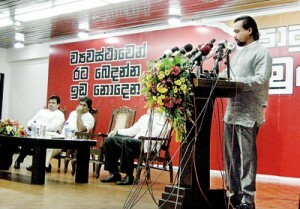 Chandrasiri, approving it in the absence of an elected Northern Provincial Council. That the timing of the indictment of Kariyawasam came in a week when the Supreme Court was hearing the cases of eleven petitioners and around ten intervenient petitioners over the Divineguma Bill has also given rise to many opinions in legal circles. One of the points discussed was a Sunday Times news item in its front page on October 7 quoting an unnamed member of the Bribery and Corruption Commission saying that after recording Kariyawasam’s statement the investigations had revealed that there was no case to file. The story remained un-contradicted. The fundamental rights cases before the Supreme Court sitting as the country’s Constitutional Court were heard by a bench comprising Chief Justice Bandaranayake, Justice Nimal Gamini Ameratunga and Justice K. Sripavan. Six petitioners challenged the Divineguma Bill saying it was inconsistent with the Constitution. They wanted the court to determine whether it needed to be passed by a two thirds majority in Parliament and approved by the people at a referendum to become law. There were petitioners who supported the Bill as well. They intervened to argue that the Bill is consistent with the Constitution; therefore, only it needed to be passed by a simple majority in Parliament. The court directed the counsel to file comprehensive written submissions as early as possible on Wednesday (October 24) morning. Thereafter, the Court declared it would send its determination to the President and the Speaker within the time period stipulated in the Constitution. On Monday (October 22) the Supreme Court also put off for November 12 the reference made to it by the Court of Appeal regarding the questions of law that arose consequent to the hearing of a case in the Court of Appeal filed by Tamil National Alliance (TNA) parliamentarian Mavai Senathirajah. When sittings resume, the Court would consider appointing a five-judge Bench to determine and interpret these questions of law; whether the governor of a province could include in his expression of opinion, the views of the Provincial Council, when the Council stands dissolved and also whether such interpretation and determination of the constitutionality comes within Article 125 of the Constitution which empowers the Supreme Court to interpret and determine such references. M. A. Sumanthiran, a TNA MP and Counsel for Senathirajah, requested the Supreme Court to refer this to a five-Judge Bench. “In a confidential letter to the President of Sri Lanka, His Excellency Mr Mahinda Rajapaksa, and to the Sri Lankan authorities, the International Bar Association’s Human Rights Institute (IBAHRI) expressed grave concern about recent threats to the independence of the judiciary and called for the rule of law to be adhered to, and promoted, in Sri Lanka. “The letter follows disturbing reports of a physical attack on the Secretary of the Judicial Service Commission (JSC), Manjula Tilakaratne, on 7 October 2012 at a time of reported heightened tension between the JSC – an independent body made up of members of the judiciary that deal with all judicial promotions and appointments – and the Sri Lankan Government. The attack is widely perceived as an attempt to intimidate the judiciary and interfere with the independence of the profession. Meanwhile, on Friday, the government hurriedly disassociated itself from calls by some ministers for the repeal of the 13th Amendment to the Constitution. Most vociferous among them were Jathika Hela Urumaya frontliner and Minister Champika Ranawaka, Mahajana Eksath Peramuna leader and Minister Dinesh Gunawardene and National Freedom Front leader and Minister Wimal Weerawansa. Their parties launched campaigns after remarks supporting the repeal were first made by Defence Secretary Gotabaya Rajapaksa. He left for New Delhi on Tuesday and returned to Colombo on Thursday. His visit was in connection with annual consultations in the field of defence, security and other bilateral matters for which arrangements have been going on for many weeks now. The event, however, coincided within the week he made the call for the repeal of the 13th Amendment, a by-product of the controversial Indo-Lanka Agreement of 1987. The move to repeal the 13th Amendment caused serious concerns in New Delhi. According to diplomatic sources, both in Colombo and in New Delhi, the Indian government considered any action to repeal the amendment as “unilateral” and held the view that such steps could force similar responses from them. They could cover issues where India has already ceded to Sri Lanka’s requests. Such a development, one need hardly say, would have escalated the cold war and the shadow boxing that is now going on between Colombo and New Delhi. The Sunday Times learns that Indian authorities raised the matter with Defence Secretary Rajapaksa but no details of what transpired were available. “Q: There are conflicting reports on the Government’s position on the 13th Amendment to the Constitution with the Defence Secretary saying that it should be abolished. What is the Government’s position? “A: The Thirteenth Amendment is a part of our Constitution and those of us in Parliament and the government are bound by the Constitution. But Constitutions can get amended. Sometimes we are mocked at saying we have amended the Constitution 18 times but the Indian Constitution has been amended more than 200 times and India is the world’s largest democracy. It is not a question that affects democracy. A Constitution can be amended from time to time to suit the requirements of that country. The Thirteenth Amendment is clearly a part of the Constitution but people’s representatives in Parliament are entitled to air their views on it. I think the Defence Secretary has spoken in his capacity as a public official and more as the Secretary to the Ministry of Urban Development. It has been said several times that there have been some issues in that area. “Q: What is the final decision on the 13th Amendment? “A: There is no move by anyone to bring it before the Cabinet or bring about a policy change. They have expressed an opinion. There is nothing official. “Q: That means as at present the government supports the 13th Amendment? “A: It is not a question of support. It is part of the Constitution and we are all bound by it. “Q: The Government, in the past has spoken of 13 plus? Where does it stand on that? “A: The government has said we are looking at 13 plus. The plus was related to the establishment of a Senate or the Upper House. Even I was present with his Excellency the President when he announced it to the Hon. Prime Minister of India Dr. Manmohan Singh. I was present personally there. My President said that 13 plus �.what we are looking at is the Upper House. The idea is to bring the minorities from various provinces to the centre. “Q: What happens if the TNA does not come to the PSC, the national issue will not be solved, how does the government hope to proceed from there? Spokesperson Rambukwella admits that he was a witness when President Rajapaksa assured Prime Minister Manmohan Singh in 2010 that the 13th Amendment would be implemented and there would be a “Plus” or more in the form of a Senate. He is now categorical, at least for the moment, that the 13th Amendment would remain notwithstanding all the pressures to repeal it. It was only in January this year Indian External Affairs Minister S.M. Krishna, who submitted his resignation on Friday ahead of an impending cabinet reshuffle this weekend in New Delhi, told a news conference in Colombo that during talks with President Rajapaksa, he had agreed to enforce the 13th Amendment and go beyond it. Minister G.L. Peiris had been asked for confirmation of the President’s promise to go beyond the 13th Amendment before Krishna made that announcement in Colombo, and Peiris had confirmed the statement. However, Rajapaksa, during a meeting with national newspaper editors soon after the Krishna visit while confirming that he had said so, added the rider that the ‘plus’ to the 13th Amendment needs to be decided by Parliament. If some partners of the UPFA are in favour of repealing the 13th Amendment, there are others who are opposed to it. One is the Communist Party of Sri Lanka (CPSL). Its leader and Senior Minister D.E.W. Gunasekera told the Sunday Times, “The 13th Amendment came as a result of the interest shown by India to disarm the militant groups including the LTTE. One of aspects of the 13th Amendment was the expansion of democracy. The objective of this was to devolve powers to the north and east. Eventually this system was introduced to the entire country’. “In fact I asked the former President J.R. Jayewardene as to why he introduced this to the entire country. His response was that he did not want to see the same thing that happened to S.W.R.D. Bandaranaike happening to him. I am the only member who was in the opposition who voted in favour of this amendment. But due to the conflict, the people in the North and East did not benefit from this amendment. It is only now the people in the East have started benefiting from the powers. The President has promised that elections will be held in the north and similar powers will be given to them. “I cannot understand why some of the members in the Government are campaigning to abolish the 13th Amendment after the President gave an assurance that elections will be held in the Northern Province. It is very important that we suggest an alternative, if we want to abolish the 13thAmendment. I do not see any benefit in scrapping the 13th Amendment. I think it is a disadvantage to abolish this now. Abolishing this would only justify the struggle carried out by the armed groups during the conflict’. However, Vijitha Herath, the Janatha Vimukthi Peramuna (JVP) parliamentarian for Gampaha District, held a different view. He told the Sunday Times, “The call for abolishing the 13th Amendment is similar to a tele-drama. It is directed by the same director with the old actors. Some people in the Government including Cabinet spokesperson Keheliya Rambukwella are saying they have no plans to abolish the 13th Amendment while the others in the government are campaigning to do so. “One of the reasons is the issue in getting the Divineguma Bill passed in the Northern Provincial Council which has not been constituted. This is a direct message to the Judiciary. That is to say that the Provincial Councils are something which is not necessary, though the Supreme Court wanted the approval of all Provincial Councils for the Bill. “Also the Budget is coming up on November 8. Our understanding is that it only has the details of the debts and the loans. There is nothing beneficial to the people. Therefore they have started a new debate on the need to abolish the 13th Amendment. The Northern Provincial Council elections are due. It is obvious that the elections will be unfavourable to the Government. Bringing up this campaign would lead to a delay in conducting the elections as the government will now claim there is a debate whether the Provincial Council system is needed. Our opinion is that the 13th Amendment is not a solution to the ethnic problem and therefore a solution which offers equality and grants the rights of all communities should be offered”. With only two months to go for a new year, the government is burdened with several issues. Even if the budget offers relief in some form, the public have to cope with a number of price increases announced in the past weeks. It takes away from one hand what is given by the other. On the international front, human rights issues remain a scourge. Momentarily at least, efforts are being made to revert to the status quo ante where Sri Lanka-India relations are concerned. Now, the cold war between the Executive and the Judiciary has heightened. With all this, the Mahinda Rajapaksa administration seems completely undeterred. Why not, when a lame duck opposition’s silence has become deafening on most issues thus negating the checks and balances needed in a healthy democracy.